One of my New Year’s resolutions is to become more organized and more efficient with my blog. One way that I attempt to do this is with a planner. Today I’m going to be sharing the planner that I use with you, along with some other tips to organize your blog. For my blogging, I use a simple monthly/weekly calendar. I’ve been using these since I was in college. Last year I bought one from Blue Sky , and I really liked it, so I bought from the again this year. The one that I bought is currently sold out, but they have similar planners in some really cute designs, and they have others sizes and formats available if you prefer. My favorite thing about this type of planner is that it has a monthly calendar that you can lay out in front of you. This is where I write out my blogging schedule for the month, as well as any important dates that I need to remember. And then it also has week pages. This comes in handy to jot down specific notes, make to do lists, or even to use as a mini journal. And what I’ll usually do is make a tentative schedule on the monthly calendar. I say “tentative” because sometimes things happen to change my schedule: a review product comes earlier or later than expected, I get a paid post opportunity that pushes back something else I was planning, or I simply change my mind! I post recipes at the beginning of the week, usually on Monday. I do most reviews/giveaways on Tuesday, unless I’m double booked for the week or the sponsor requires a different date. Wednesday is wide open. This Wednesday is an organizing post, but next week could be home decor, or a sponsored post. On Thursday night my Friday Favorites party is posted. And sometimes earlier in the day, I may have something else, particularly if I didn’t get a chance to post on Wednesday. And then the weekend is generally reserved for sponsored posts that might come up. So as you can see it’s pretty flexible, but it still gives me that little bit of structure that I need to get things done and be half way organized. You can also print out your own monthly calendars. I shared some cute ones here the other day. 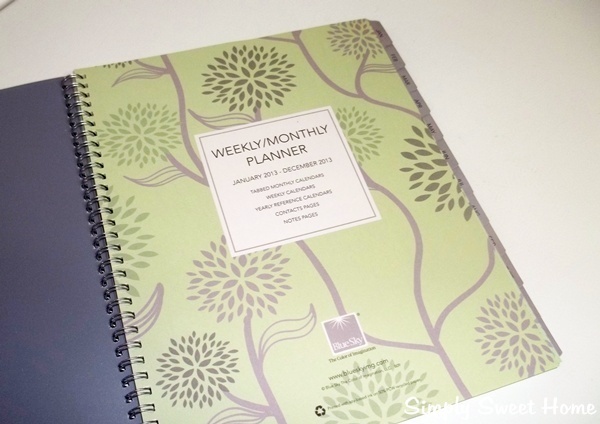 Or consider printing out of these blog planners. Use online calendars. My email service is Outlook/Windows Live (also known as Hotmail). I add upcoming projects to my calendar, due dates for sponsored posts, as well as reminders to contact people. I could seriously write an entire series of posts on how great the Outlook calendar is. But for the purposes of this post, I will tell you that my favorite thing about it is that you can set up your calendar so that alerts come to your email, as well as your Iphone or other mobile device. The alerts are great, because a calendar alone just sits there–if you don’t look at it, it is useless, but if something pops up in my email or chimes on my phone I will see it. And that is what I need! This just serves as a list to-do list, and it helps to keep me on task And I’ve even referred back to this list to help me verify my Paypal transactions when I do my accounting. Come up with a balanced routine. I can’t really give advice on this because I struggle with this a lot! I would love to be the person that writes at this time, and answers emails at this time, and always comments, and always tweets, etc. But I just haven’t got a system down for this yet. Maybe it will happen this year! One thing that I’m going to TRY and do is come up with a sort of “check list” of things I need to do each week. It would be similar to the printable blog planners, but it would mostly revolve around networking and other tasks and sometimes get thrown on the backburner. Do you have any tips for better blog organizing? Or tips on keeping a balanced routine? If so, I’d love to hear them in the comments! 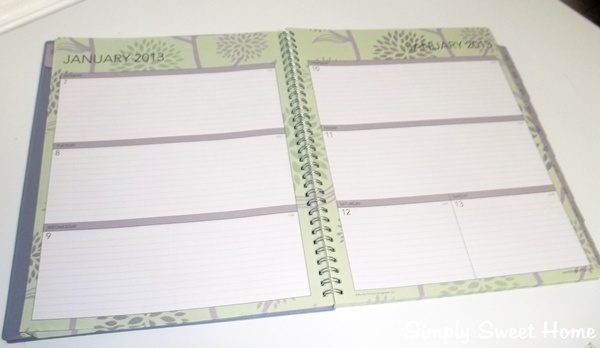 For me, January is all about organizing and setting new goals for the year. I like to re-access the things I did last year, see what went right and what went wrong. Then I like to set goals for the new year. And above all I see it as I time organize. And by organize, I mean everything from coming up with an organized plan to meet my goals, to decluttering and re- organizing my kitchen cabinets, to getting a new calendar and planner for the year. For today I’ve got 5 free printable 2013 calendars for you! Just click the link below each one to get the full calendar and print it out. These are great for your desk and fridge, and they’re also stylish and cute. Hope you enjoy! Happy New Year everyone! Friday Favorites is back after a little holiday break! Today apart from linking up your current projects and recipes, I’d love to invite you to link up your favorite posts or favorite post round-ups of 2012. I always enjoy looking back at everything I did over the course of the year. It’s also fun to see which posts got the most hits, comments, etc! I have to apologize that there are no features for today’s party. After doing a little research, I learned that the latest version of WordPress is currently experiencing some problems; that is, it is deleting some script codes such as the Linky Tools code when you schedule your posts ahead of time. For this reason, last week’s party didn’t not include the linky, and I was out all day and didn’t realize the mistake till it was too late. Oops! Planning a wedding, shower, or a holiday party? As you know the holidays are a busy time, and if you’ve got a party or event to plan, it can be very stressful, especially if you are doing the work at the last minute. But it really helps if can find everything you need in one spot. eFavorMart.com can help you get stocked up on all the decorations, favors, and other supplies you need, so that you can back to the rest of the planning. They have lovely table decorations, including table cloths, runners, centerpieces, candles, placecard holders, chair covers and sashes. They also have sweet party favors for all occasions, including wedding bubbles and cute favor bags and boxes for weddings and all occasions. I especially love their collection of baby shower favors. They have a lot of cute things that would be perfect to tie in to favor bags or use as cupcake toppers like little bottles, pacifiers, and stores, and then they have larger boy and girl toppers, as well as baby blocks, and cute baby candles. They also have everything you need to make your own flower arrangements, bouquets, corsages, and decorated favor boxes, included silk flowers, sprays, ribbon, beads, tulle, and so much more. And if you’re planning a wedding or bridal shower, they have the cake stands, cupcake stands, cake toppers, and even the wedding cake fountain to help you set up up aprofessional and elegant looking cake. And they sell really great “lot” packages in various colors. These are assortments of decorations and accessories, which are not only a great deal, but also help you to get a lot of the stuff you in in one package. Each new year we make a list of goals or projects for the year, but by March many of these fall by the wayside (if not before then). The key to achieving your new year’s resolutions and completing your projects for the year is to set attainable goals and schedule time to work on all your projects and goals. 1. Set realistic, attainable goals. 2. Set goals that can be easily measured. * I will post 5 times a week on my blog. * I will get 50 new followers this month. *I will get 5 sales a week. * I will meal plan each week. *I will try a new recipe each week. 3. Give yourself a time frame or deadline to achieve your goals. *By the end of the month I will have my first sale. *By the end of the month I’ll have 10 new craft projects completed. *I will declutter one closet each week. 4. Schedule time to work on your projects and goals. In other words, treat it like a job. This can be as general or specific as you’d like it to be, but you should make scheduled time for all your endeavors and be consistent. *I will post on Monday, Wednesday, and Friday. *Each morning I will spend two hours working on my blog or networking. *Each day I will clean one room in the house. *Each morning I will list new items in my shop. 5. Write down your schedule and/or document your work. -Keep a planner to write down your schedule and the tasks you want to perform each day. -In your planner, in a separate notebook, or a on a blog, make a list of what you do each day. This will help you to measure your progress and will help you to stay on task. Great Calendar For You: For those of you who have goals to declutter and keep a cleaner house this year, you may want to have a look at this year’s Declutter Calendar over at My Simpler Life. 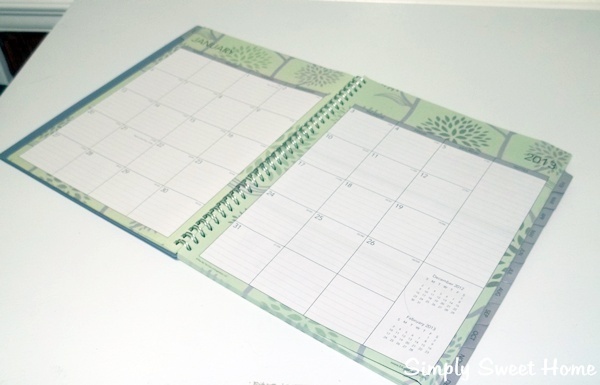 The calender gives you a different task to do each day to help keep your house clean and clutter free. You could also have a look at this calendar and then make your own with your specific needs and tasks in mind. Today I’m going to tell you about a great website where you can make custom ecards, invitations, and annoucements. It’s called Purple Trail. Whether you want to send birthday or shower invitations to your friends, an ecard to your honey, or announce an event that’s happening on your website to your mailing list, this is the site for you! The site is very user friendly. If you can use the paint application on your computer, you can use this site. It also differs from other card sites you might have seen, because there are no advertisements on your cards and invites. My favorite thing about the website is the customization available for cards. When you create your cards, you can choose from one of their awesome designs and simply add your message. Or you can add your own personal touch and flair to their design. And if you prefer, you can add your own clipart or personal photos for a complete personalized look. You can even add music and sound to your card! Another thing I personally like about the site is that when you create a card or invite, you can choose whether you want your creation to be private or public. I like this because I tend to be a private person. However, when I was reviewing the site I decided to create an invitation for the Christmas Festival I’ll be hosting on my blog in December. (Yes, I’m aware that it’s August, but I wanted to experiment!) So when I created the invitation I chose to make it public, so now not only will I be able to send it to people on a mailing list, but it also has its own unique webpage for people to view. (What a great way to invite Twitter followers and people on other networks to the event!) You can go here if you want to check out the invitation I made. You can go to Purple Trail today and sign up for a free account, and you’ll be making your own custom cards and invites in minutes. And once you’re a member, you can even upgrade your account to a Basic, Pro, or Premium account and take advantage of a whole bunch of extra features. Today I’m giving away a Basic Plan worth $14.95 to one Simply Sweet Home reader. The Basic Plan includes animated themes, full export of your address book, scheduled send, payment collection module, a larger maximum number of invitations per month than the free plan, and more extras! –One entry for following me publicly on blogger. -One entry for joining my feedblitz mailing list, or 2 entries if you are already a member prior to this giveaway. -One entry for subscribing in a reader. -One entry for following or subscribing to my new business blog. -One entry for following me on twitter. -One entry for tweeting about this giveaway. 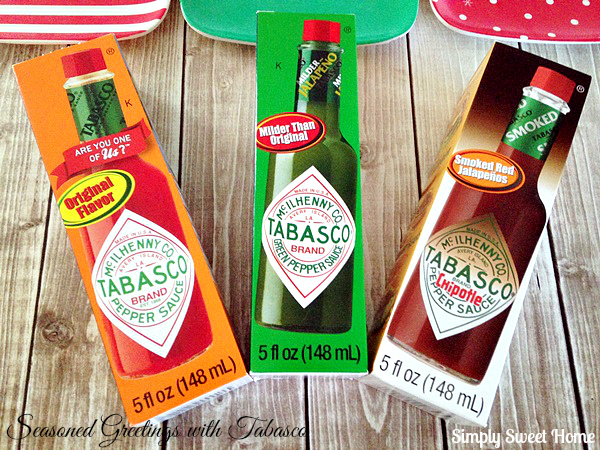 -One entry for becoming a fan of Simply Sweet Home on facebook. -Two entries for writing about this giveaway on your blog and linking back to Simply Sweet Home. Since summer time is right in the middle of yard sale season, I thought it would be pertinent to go over some tips for planning a successful yard sale. If you’ve never had one, you’re probably thinking, “There’s nothing to it. Why would I need tips?” But yard sales are actually a LOT of work. Hopefully these tips will lessen the stress. Today I’m starting with some basic tips about laws and planning. -Check your local laws and neighborhood ordinances regarding yardsales. Many places require you to get a permit and have it displayed at your yardsale. If you fail to get a permit, you may get fined or have your yard sale shut down. -Also, if you plan on having more than one yardsale, keep in mind that some places now have laws limiting the number of yard sales you can have in a year. -In some areas there are also laws restricting sizes for signs or limiting the number of days that you may display your signs. -At least a month ahead of time, you should line up tables and racks to be used at your yard sale. If you don’t have any on hand, you can usually borrow some from a friend or family member. Or you can get some from a rental place. -Throughout the year, keep an empty box in your house. Whenever you run across an item you don’t want, you can just add it to the box. When the box is filled, label it and place it with your other yardsale boxes in the garage or attic. Then get a new empty box to put in the house. -Don’t forget to plan for rain. If it rains, will the yard sale go on as planned or will it be postponed? You should include this information in your newspaper ad. -Don’t plan to have your yardsale on a holiday weekend, as many people will be out of town or going to special events with their families. -Decide on the exact date(s) and times for your yard sale, and make plans for taking a vacation day at work. -Before deciding on a date to have your yardsale, look at the paper to see when the majority of people are having their sales. Friday seems to be the most popular day. If you can’t get off work, then Saturday will do, but you probably won’t get a lot of customers past noon. If possible, try to plan for a two-day sale that will run All Day Friday and Half the Day Saturday. Thursday and Friday is good too. You can try it on other days as well, but Thursday through Saturday is your best bet. -Be sure that you save plenty of grocery bags to put your customer’s items in. If you don’t save grocery bags, and you don’t think you’ll have time to save enough of them before your yard sale, you can probably get some from a friend, or you can go to your local grocery store and ask if you can get bags out of their bag-recycling box. You can also order grocery bags online from wholesale companies. Today I have a great list of resources to help you plan the perfect shower or wedding. A lot of planning goes in to even the smallest and simplest party, but these sites should give you all the ideas, information, and supplies you’ll need, or at least give you a good start. Simply Wedding Stuff – Great check list for organizing and planning your wedding shower, along with a lot of great items and info. BridalShower.com – Shower games, party favors, supplies, and themes. Bridal Shower Ideas for You – A list of ideas on everything from decorations and centerpieces to a the party favors, the cake, and a checklist. Bridal Shower Themes from Frame Your Day – A list of shower themes and ideas for each theme. Party Supplies World – More supplies for your wedding shower. Abee Bridal Showers- Free Games – This site has a lot of info on wedding stuff. This particular link has 4 lists of free bridal shower games and descriptions of the games. Wedding Favors to Go – Favors for all themes and seasons. To Love and To Cherish – Blog about weddings and showers. They also sell invitations for all occasions. Bachelorette Superstore – Party favors, supplies, and everything else you need for a shower or bachelorette party.